"India is not scared of the guns here in Kashmir -- it has a thousand times more guns. What it is scared of is people coming out in the streets, people seeing the power of nonviolent struggle," says the senior leader of the moderate wing of Kashmir's main separatist alliance, Hurriyat, and a key organizer of the civil disobedience campaign that began earlier this year, filling the air with chants of azadi. The number of armed attacks in the valley, meanwhile, has dropped to its lowest since the insurgency began in 1989, according to Indian officials. How has India responded to the the peaceful movement for freedom in Kashmir? Not recognizing the reality of change on the ground, the Indian government has attempted to demonize the struggle as LeT led terrorism. Beyond that, it has continued to use force against unarmed, peaceful civilian protesters on the streets of Kashmir. Wall Street Journal reports the current situation in Kashmir as follows: Indian troops often resorted to lethal force, killing more than 50 Kashmiri civilians. Scores of protesters and separatist politicians have been thrown behind bars or placed under house arrest. Indian officials say these detentions are necessary to preserve public peace, and that the troops have to use force to maintain law and order. Some half a million Indian soldiers and policemen remain deployed in the Indian-administered part of Jammu and Kashmir, home to 10 million people. (About 5 million people live in Pakistani-held Kashmir.) Indian laws grant troops in Kashmir almost total immunity from prosecution, including in cases of civilian deaths. Srinagar, once India's prime tourist destination, is dotted by checkpoints, its indoor stadium, cinemas and hotels surrounded by sandbags and converted into military camps. Broadcast media are censored....As Kashmir descended into chaos after these killings of innocent civilian demonstrators, India responded with increasingly severe curfews and lockdowns that continue. Often they come without prior warning or formal announcement, as in Srinagar over the past weekend. The events in Mumbai and the media spotlight on terrorism have obscured the reality of the 60-year peaceful struggle of Kashmiris ignored by the media and dismissed by India as Pakistan-backed terror in the Srinagar Valley. In spite of the Indian government's efforts to mislead the world about the reality of Kashmir, there are some members of the media such as Yaroslav Trofimov of Wall Street Journal and activists like Arundhati Roy have made their efforts to help keep the Kashmiri freedom flame burning. Roy wrote recently for the Guardian newspaper as follows: Not surprisingly, the voice that the government of India has tried so hard to silence in Kashmir has massed into a deafening roar. Raised in a playground of army camps, checkpoints, and bunkers, with screams from torture chambers for a soundtrack, the young generation has suddenly discovered the power of mass protest, and above all, the dignity of being able to straighten their shoulders and speak for themselves, represent themselves. For them it is nothing short of an epiphany. Not even the fear of death seems to hold them back. And once that fear has gone, of what use is the largest or second largest army in the world? Last 4 years in South Asia saw Pakistan ready to settle the Kashmir issue with no positive results due to the lack of any sense of urgency by India. With armed Muslim groups in Kashmir dormant since the post-2004 thaw and President Musharraf of Pakistan eager to make concessions, the world has seen an era of relative peace in Kashmir which appears close to shattering again. It is clearly a missed opportunity in South Asia. In the context of Pakistan's anti-American public opinion, the country's ongoing crises, and the growing US demands on Pakistan, the future of US-Pakistan relations and the chances of success in the "war on terror" do not look particularly bright. The only solution to this darkening mood in both nations is a serious and sincere effort by each to improve their bilateral relationship based on a recognition of mutual interests and genuine needs. The incoming Obama administration has an opportunity to change the US tone with Pakistan in January 2009 to make the friendship genuine and useful to both partners in the war on terror. Barack Obama's oft-repeated position that Kashmir and India-Pakistan relations can not be isolated from the "war on terror" in Afghanistan, Pakistan and elsewhere in the world offers a good starting point for discussion. As long as the Kashmir issue remains unresolved, Pakistan, India and the US can not win the "war on terror" and bring peace and stability to the South Asian region, including Afghanistan. Recent Mumbai attacks and the ostensible Kashmir link via LeT have confirmed that yet again. India's opposition to Mr. Obama's desire to mediate will test the Obama administration's resolve in seriously pursuing resolution of Kashmir. In LeT's manifesto, it calls for Islamic Caliphate spanning South Asia. LeT people have been found fighting in Afghanistan, Iraq etc. So down goes the theory. Obama is definitely not buying this BS, as Kerry pointed out.John Kerry says that the important point is to bring ISI under "civilian control and should not be allowed to make their own decisions".period. 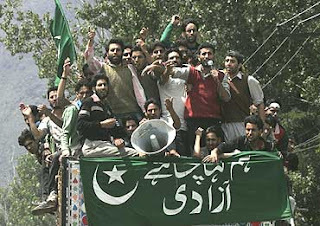 Besides, Hafiz sayeed clearly said that things are not going to stop even if "Kashmir dispute" is solved. Anyway, by making a link between "Kashmir grievance" and Mumbai attacks, you are clearly suggesting that terrorism is a legitimate instrument of state policy. (not insurgency mind you..we have two dozen of insurgencies) That shows your culture and where you are from. If you bother to read the facts and watch the video, you will realize that you are buying the Indian government's line, hook and sinker. Please do not ignore the facts on the ground and be more thoughtful and analytical. Don't stick to the dogma that hasn't worked for over half a century. Personal attacks and bigotry will not help either. Get out of the box and think more freely. Happy Vijay Divas Riaz. December 16, 1971. Today, the whole of India is celebrating the nation's emphatic victory in the 1971 war and the subsequent dismemberment of Pakistan. It doesn't surprise me one bit. This kind of celebration provides the context for the enduring animosity between the two nations in South Asia. BBC is reporting that Hindus in Pakistan are protesting action against Jamat-ud-Dawa. Many in Pakistan's minority Hindu community are poor farm workers. One protester, Biga Ram, told Reuters news agency: "How can an organization be terrorist if it's been providing food and water to us despite knowing that we're not Muslims?" She added: "They're friends of humanity. We condemn the ban. It's unjust." Some of the banners read: "Do not ban our saviour!" Bhai Chand, a Hindu community leader, told Associated Press the charity had set up water wells in the desert. Pakistan has yet formally to ban Jamaat-ud-Dawa, which has been put on a blacklist by the UN Security Council. Its bank accounts have been frozen by the Pakistani government and a number of members detained. India blames Lashkar-e-Taiba, which is fighting Indian rule in Kashmir, for training the Mumbai attackers. The group and the Pakistani government deny involvement. all terror organization has charity frontends..like Hezbollah, Hamas, Muslim BrotherHood etc...LTTE went one(or more) step further and filled the vacuum with fully-fledged civilian and military infrastructure. If UN bans JuD, it needs substantial proof to be submitted to it. Dawood Ibrahim has a red corner notice on his name and address. So the white-wash about no proof will not fool anyone. Even China had to vote positively this time around regarding the JuD resolution.Ground support for terror organization could be becoz of charity efforts and that's is why they are doing it. With all the glib talk of cracking down on terror, Pak haven't even yet banned JuD even after UN declared it as a terrorist organization. Pak also didnt not oppose the motion overtly in UN(not like it would have mattered). Things couldn't be more clear. Charity Orgs - I do know RSS and bajrang Dal also did great work in Gujarat (Bhuj Earthquake) and Maharashtra (Latur Earthquake). So, it doesn't surprise me. 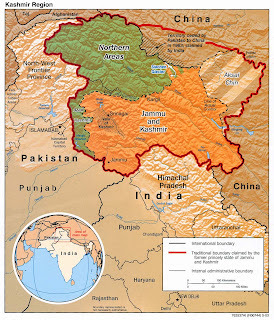 One can read a couple of posts in the same blog (interviews of Arundhati and Pervez Hoodbhoy) and easily conclude that Kashmir is not the root of the problem. It's rather rooted in (India and Pakistan's) lack of knowledge, over-dependence on religion for everything and history of the subcontinent (obviously including Kashmir - as a small part). Arundhati clearly points out that LeT belongs to group A - who would strenthen the side A arguments that you cannot place a context for terrorism. Hoodbhoy placed context to a different pivot - America. He pointed out that these terror groups draw their line of attack based on their relation with (allies and enemies) of US. We saw one demonstration of this in the Mumbai attack also. In the current poverty-struck India, I cannot even dream of an India that is not an US ally. Even China is an US ally, at least in business. So, India will always be on the wrong side of the line. So, whatever the solution be for Kashmir, it's not going to satisfy a majority of subcontinent people (had it been otherwise, we would have a solution by now). Interestingly the article did not focus on possible solutions - that would have made my job easier to highlight those grievences. It will add to their injury and terrorism in South Asia will grow even stronger. RSS is not a "terrorist organization". It doesn't behead Pak army captain in front of public or operates in enemy territory(Pakistan or Bangladesh or for that matter China..so there is basically no argument). It is loosely decentralized all across the country by clear manifesto of a declared cultural nationalism. When an earthquake or calamity happens, it will help people irrespective of their religion or region(unlike arab charities). I was not intending that all charity org are terror org ;-)..& was suggesting that in most cases terror orgs do have legal front ends. Comparing LeT to RSS is laughable. RSS even has a Minority Cell consisting of Muslims and now it has quite a following.RSS was created so that people of India who are diverse in culture and language are bind together tightly so we put a united front to external threats. India had been plagued by European and Islamic rule for several hundreds of years becoz of disunity. So they do have a point. I don't know why "Diganta" is hyphenating India and Pak in "over-dependence" on religion. Pak is one which is a theocratic state and internationally recognized terror hub. It is silly to isolate the Kashmir issue from the broader problem of language-based political independence to each of the regions in the Indian subcontinent. Pakistan has a boiling problem in its frontier with Balochistan and Pashtunistan sternly demanding broader independence from the Punjabi dominated Pakistani military. Both these regions have been crassly divided by artificial boundaries, similar to Kashmir. Antagonism runs also in Sind, though to a smaller extent. In comparison, India has much smaller problems to handle. The seperatist feeling is limited only to a minor percentage of the total population. Both India and Pakistan have a long way to go in federalizing their constitutions and ensuring regional democracy. But a total break-up into pieces is not an option ! The success of the Pakistani federal state is important for that of the Indian Union. The vice-versa is equally true. The subcontinent is one connected region, and any minor disturbance will have its effects felt all over - in a fashion similar to Yugoslavia. People who care for a strong Pakistani state should re-evaluate their strategies. It is ludicrous to compare Kashmir with NWFP or Baluchistan. People of NWFP and Baluchistan have had their say in this decision when they overwhelmingly elected Muslim League over Ghaffar Khan's party (which was allied with Congress) before the partition. Kashmiris never got that chance, in spite of UN resolutions and Nehru's acceptance of a plebiscite in Kashmir. Watch the Hoodbhoy video and Nehru's own words to get a better perspective. What about the 1949 resolution of the Loya Jirga in Pashtunistan ? Why does the Pakistani state still cannot impose its control in NWFP ? Why did Salar-e-Millat Liaqhat Ali Khan get assassinated ? Does Pakistan agree to have a referendum on the Durand line ? Balochistan is totally another story : it accounts for more than 50% of the Pakistani land area and has vast natural resources. The democracy and human rights situation in this region is dismal (the poverty also appears to be significantly higher than Pakistani national value). By the way, kashmir compares favorably to the gross Indian value on poverty. All these are very touchy issues, and India is bound to exploit them if Pakistan demands a return to the 50 year old UN resolution, which Nehru accepted out of his stupidity. The fact is we don't live in the past, but in the present. And emotional issues like nationalism don't get evaluated inside courts. As far as India is concerned, Kashmir is exactly the same as any other state : we have separatist problems in Assam, Tamil Nadu and in the north east. We cannot afford to treat them separately : this is basic survivalist instincts. If Pakistanis really care about the well-being of Muslims in India (which I highly doubt), it is time to look beyond Kashmir. Kashmir has just 6 million Muslims out of the total 150 millions living in India. The majority live in little pockets in Uttar Pradesh, Andhra Pradesh and Maharashtra : each of these pockets contain more than 10 million Muslims. How are they different from the Kashmiri Muslims ? Why don't they deserve independence ? Who is there to prevent a complete rerun of the horrors of partition : massacre of Muslims and Hindus in millions ? Again, your comparisons are ridiculous. Comparing an alleged Loya Jirga of doubtful composition with the UN resolutions? Come on! Be serious! Pakistani state has control over the province of NWFP. FATA is separate from NWFP. FATA's system is a legacy of the Brits that seems to have worked reasonably well and should continue. Baluchistan does have a small insurgency by a minority of Baluchis who represent the interests of a few tribal chiefs and represent a small minority of Baluchistan population. Free and fair elections held repeatedly have given the insurgents only a small percentage of the total vote. What you are offering is a way to distract from the real, core issue of Kashmir , an Indian government strategy that has not worked for over 50 years. It's time you understand it and get on with seriously addressing it. Obama understands it. Let's hope you do, too. In fact, Obama is really smart and I hope he really means what he says " Afghanistan is related to the Kashmir issue". The sentance also means "Kashmir is related to the Afghanistan issue". You can shut your eyes down to the reality in the frontier region, but when it bites, reality will be very bitter. Pashtuns are a fiercely independent people and think of the Punjabis in no gracious terms (probably worse than how Kashmiris think of Biharis). The last referendum for Pashtuns was a joke : there was no option of independence or joining Afghanistan. Why would any Pashtun in any rational mind choose India over Pakistan ? So Pakistan did win, but the number of people who voted is too low to count. The Loya Jirga of Pashtuns in 1949 has officially declared the Durand line invalid. You might declare the Loya Jirga as unimportant, but for Pashtuns, it is the most important functional political unit. A strong and stable Afghanistan (which is a US priority today) will automatically gain the political voice to demand suzereignity beyond the Durand line. When presented a choice between Afghanistan and Pakistan, FATA and NWFP will automatically choose Afghanistan/independence. Baluchistan is a more important problem than NWFP because Pakistan's economy is highly dependent on its natural resources. Pakistan is lucky on the Baluchi issue because Iran is against Baluchis too. So there is no cross-border terrorism, as in Kashmir. But I don't know how long that will last : especially if there are tremors of seperatism running in the subcontinent. It is time we (Pakistanis, Indians and Afghans) thought outside the box. It is impossible to achieve a settlement on these issues which will be favorable to every party. Any tremor / disintegration at any region will be suicidal for all these nations. The situation is no longer like Bangladesh. Now, we have a clear choice (a) Keep pushing for hard, demarcated boundaries, and let the conflict simmer (b) accept a fuzzy boundary, a free transit of people, and a recognition for political and cultural units ( Kashmir / Pashtunistan / Baluchistan ) which spans across the frontiers.. This is not very digestible, but this is the only stable solution. We should hope of achieving a functioning union similar to the European Union. (b) is not acceptable to many people in Pakistan because they view India as an infidel nation (even though it contains 150 million Muslims). This line of thinking assumes that Pakistan is closer to Central Asia both by race and religion. This is stupid of course, but this idea has its followers. (a) is dangerous because both India and Pakistan are nuclear armed. When their survival as entities is under question, no nation will hesitate before using nuclear weapons (irrespective of what they say officially). The question of Kashmir actually comes down to a question of survival for both India and Pakistan. On such an issue, damn the UN resolutions. This is actually a question of nuclear weapons. Let's recognize it as such, and find a solution. Your conclusion "The question of Kashmir actually comes down to a question of survival for both India and Pakistan" is excellent. I say Amen to that. The rest of what you believe about Afghanistan and "Pashtunistan" is just a figment of Indians' imagination. Please do read this article "The Lawless Frontier" by Robert Kaplan (one of the most important US commentator on geopolitics). This article was written even before 9-11. USA has much higher priority to ensure stability in the region today. It all comes down to Pashtun nationalism : whether you admit it or not. By now, I hope you are convinced that I (and I speak of most Indians) actually care about stability of Pakistan and its borders as existing today. We really do not want the country to split (unlike during the Bangladeshi liberation). It is in India's strategic interest to ensure stability on Pakistan's frontier. An important part of that is to ensure that there is no volatility and that the people are content. This can only be done by a high degree of federalization which is not the case - either in Pakistan or in India. Ray - I fully agree with you that a peaceful, stable, rational and prosperous India will be a blessing for Pakistan....stop spending those extra $s on Kashmir, on blocking water to Pakistan, and on creating mess in NWFP and Balochistan...we all 'south Asians' will benefit from this. Unfortunately even the educated and prosperous Indians overseas have grand dreams of becoming a super power through a path that will only lead to death and destruction. Pakistan has been engaged in a brutal war for the last 60 years. And this war is not with India. It is with linguistic nationalists everywhere. For any practical Pakistani nationlist, it is not India that matters but the very integrity of Pakistan. And the glue that is holding Pakistan together is loyalty towards religion (Islam). When an alternative loyalty stems up (such as loyalty towards language), it gives nightmares for the nationalists. This is the reason why even an innocent demand such as naming the NWFP as Pukthoonkhwa makes the nationalists shudder. Pakistan has a dismal record in provincial autonomy. Even the education is not provided in regional languages. You should seriously learn from India. What is holding India together is not religion, it is something deeper : civilizational ties, which is similar to the idea behind the EU. Linguistic nationalism (which belongs to the age of democracy) can be diffused only by this, not by religion (which belongs to the age of feudalism). In fact, it is feudalist political structure that encourages religion as the nation's unifying glue : the very idea of partition of India was supported by wealthy zamindars in Punjab. Even today, all the major politicians of Pakistan are descendants of feudal dynasties. Compare with India : we have had P V Narasimha Rao, Atal Bihari Vajpayee, Manmohan Singh etc, who are not at all feudal land lords. In fact, even the earlier prime ministers of India were noted freedom fighters in the independence movement. After Quaid-e-Ajam Jinnah, did Pakistan have one single statesman to lead the country ? The only way statesmen come forward is by encouraging linguistic nationalism, and an even more progressive civilizational nationalism. Pakistani army has been targeting such political parties and suppressing them all over the country : Awami National Party, Jamhori Watan Party, Pakthoonkhwa Milli Awami Party (in fact any party which has the word "Awami" in its name). The Taleban are very much a creation of the Pak army so as to suppress the Pashtun nationalism from spreading towards Kabul. Do you think that anybody believes that the Pak army is fighting the Taleban ? Why would they, when they are essential to the very survival of the Pakistan idea ? The recent murder of General Faisal Alavi is not helping the army much in keeping up that charade. India is not stupid to ignore all these links. As I said earlier, it is not in the strategic interest of India to destabilize Pakistan or disintegrate it. But it is definitely in Indian interest to increase (a) secularism (b) provincial autonomy (c) linguistic and civilizational nationalism in Pakistan (d) democracy (e) making the military accountable to the parliament. The cold-start doctrine that you have mentioned achieves none of the above 5 objectives, and will play right into the desires of the enemy camp. Three men went missing in Indian-administered Kashmir in April. Nothing extraordinary about that, but some time later their bodies were discovered near the Line of Control (LoC), which separates Indian- and Pakistani-administered Kashmir - a fate which militants trying to cross the border often meet. But during investigations, the police discovered that the men had been killed in a staged gun battle in a frontier area. The probe also revealed that a senior officer of the Indian army - a major - had the three men kidnapped by offering them jobs as porters. The troops later informed the police that they had killed three militants. The army also claimed to have found Pakistani currency and arms and ammunition on the three men. The major has been suspended and another senior soldier transferred from his post. The army has pledged to "co-operate" with the police in investigations. So have 'fake encounter' killings - where the security forces are alleged to carry out extrajudicial killings - returned to Kashmir? Political leaders across the spectrum - pro-Indian, anti-Indian and government ministers - think so. "There are hardliners in the Indian Army and intelligence agencies, as there are in Pakistan, who think that by raising the bogey of infiltration and gun battles near the border they can create terror among people and also put pressure on Pakistan," says Mehbooba Mufti, prominent pro-India leader who heads the largest opposition party in the state. Kashmir's law minister, Ali Mohammad Sagar says there have been "several proven cases of fake encounters in the past 20 years". Investigating the latest "fake encounters" of the three men from Nadihal village in Barramulla district, the police said that the army major had even been rewarded with "a promotion and/or a cash reward" for killing the men whom they described as "militants". But the army rejects this allegation, saying cash rewards for killing militants are a "myth".